"Stick with it. Content Marketing doesn't work when you think of it as a one time service." My name is Mark Cyphers, I am the President at DC Web Designers. We are a web design and digital marketing agency with almost two decades of providing internet solutions for the Washington DC metropolitan market. Our signature design is a clean, distraction-free, user-centric, presentation layer, that speaks directly to the target audience. We pride ourselves on our post-launch efforts including full digital marketing solutions using organic SEO, Content Marketing, Social Media Initiatives, Email Campaigns, Pay Per Click Marketing, and Target Marketing. We use analytical software and toolsets to manage traffic, lead flow, and user to customer conversions. All of our clients have different needs, and we customize our efforts to meet budget expectations, internal resources, skill-sets, and site goals and objectives. We believe in a philosophy that believes in maintaining the health of a website using scheduled updates and enhancements on an ongoing basis. In short, rather than doing a full redesign every three years, make small site changes each month that continue to improve the look, function, and marketing efforts of your web presence. Our staff is made up of seasoned experts, many with more than 10 years experience in the digital space. All of our projects come with a three-person team that includes a Project Manager, Lead Designer, and Lead Programmer. These senior staff members build teams underneath them to support the efforts of each project. Our clients enjoy the personal experience, and we have a 98% client retention rate that we pride ourselves on. Content Marketing in its most simple form is creating valuable content that you publish and repurpose in strategic locations throughout the web. By creating a program that systematically creates content and delivers it directly to the doorstep (or browser) of your target audience, your organization can generate additional traffic, increase the lead flow, and convert more users to customers. The secondary benefit of Content Marketing is organic search engine placement. By creating keyword dense, optimized, content, you will improve your Google rankings. Most organizations don’t know where to start, and they don’t realize it should be a scheduled program in which you identify monthly milestones in creating content topics, review, and publishing procedures. Once your clients understand that the content they are creating is directly in their expertise wheelhouse, it becomes easier. The results of Content Marketing are also a major incentive for our clients to stick with it as well. VR & AI are new, and forward-thinking organizations are typically the ones who engage in new technologies. Your brand perception would benefit if you were using these technologies in various capacities in your organization. Just like when mobile websites emerged, the first on board were considered leaders, and investors in their company, people, and brand. I see VR & AI taking similar paths, filling leadership voids in product and service presentations and other capacities of using the technologies. Stick with it. Content Marketing doesn’t work when you think of it as a one time service. 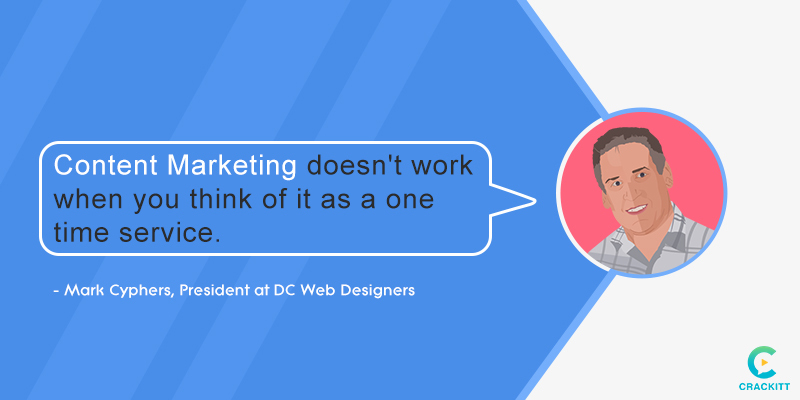 Don’t think of Content Marketing as a web service. It is not. It is a marketing service and needs to be treated as one. It should have the proper internal resources behind it just like any other service you feel important to your organization. Consistency and valuable content. If you offer consistent, valuable content on a regular basis, the results will come. But without either of those, you won’t reap many benefits. Treat the content as a prized possession and make sure that it has relevant subject matter for your targets. Address pain points and solutions in your published content that your audience can not only relate to but use. Educate your clients on the importance of your solutions and show a direct impact on the content you provide. Hmmm… #1 I’d say, don’t be afraid to use other people’s valuable content (as long as it is not a direct competitor). If you see content that has value for your users, there is no shame in using it (and giving proper credit obviously). #2 Create design themes for different content types. This way you don’t have to put design effort into your work every time you publish, and it also creates brand consistency. So if you use the same layout each month for your blog posts, you only need to add the content, and your users will recognize it as your blog’s signature trait and grow accustomed to your branding elements. #3 Don’t date your content. When you publish content, don’t put a date on it. If the content is relevant to your target, then it doesn’t matter when it was written. But if you put a date on it and someone reads it a year later they will have an unconscious feeling that it is dated and not relevant anymore.